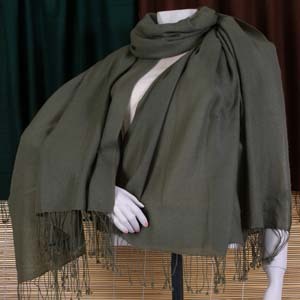 Our Nepal Cashmere Pashmina Shawl Wraps are made from the fine, downy wool of the Cashmere goat, indigenous to the Himalayan region of South Asia. They are prized for their wonderful warmth and softness. Power-loomed by native South Asian artisans. 85 in. x 40 in. Dual purpose item - can be used as body wrap or sofa/bed throw. Guaranteed authentic. Shipped directly from the source.